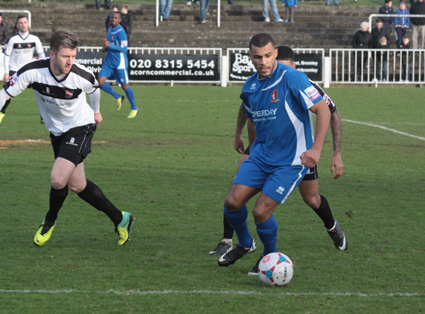 Hayes & Yeading travelled to runaway leaders Bromley on Saturday and having endured strong winds throughout and with the game ending amidst thunder & lightening with monsoon like rain, it was the home side who a little undeservedly took all three points. Manager Phil Babb made one change to the line-up that had started the abandoned game at Dorchester on Tuesday evening with Ryan Blake coming in for Derek Tieku who took a place on the United bench. Both sides took some 20 minutes to find any real fluency in their play although with a crosswind in their favour it was United who were to have the lions share of the ball during this time, the best opening seeing Inih Effiong incorrectly flagged for offside but the newly arrived striker could not bring the ball under control anyway. 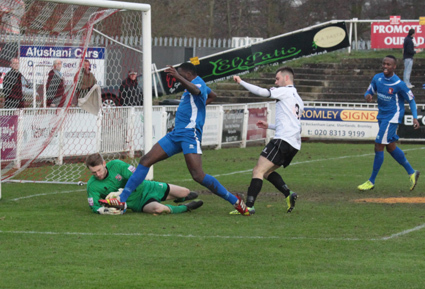 The first real effort came on 20 minutes from United as Effiong and Ryan Blake exchanged passes with the former firing a curling effort towards the far corner that drifted wide of the Bromley goal. Six minutes later and with their first real effort at goal the Lillywhites took the lead when Brendan Kiernan's corner went through Daniel Wishart's legs at the near post going low across to the far post where home skipper Rob Swaine got goal side of Charlie Wassmer to fire the ball home. Seconds later a real chance came for United as Blake chased down a weak Jack Holland backwards header, arriving at the same time as keeper Joe Welch, the ball cannoning off the United striker and out for a goal-kick. Just before the break Jamie Young had to be alert to keep from going two down. Bradley Goldberg struck a free-kick from 20 yards that ballooned up off the wall and Kiernan pounced on a weak clearance only to be denied by a diving Young. The second period again took a while to get going and with the hour mark almost upon us United almost levelled the game, twice. Wishart finally found some space on the left, beat his marker before laying the ball across the edge of the box to Huw Johnson who saw his shot on the stretch deflect off the back of Hollands' heel before spinning agonisingly wide of the target. The resultant corner by Adam Everitt picked out skipper Dean Inman who saw his volley headed off the line by Dean Pooley. With just under 20 to play the home side maybe should have made it two when Goldberg received the ball in the box with his back to goal, held off the attentions of Everitt only to fire weakly on the turn straight at Young. Two minutes later a ball in from the left by Joe Anderson found former United striker Pierre Joseph-Dubois though on goal, Young did well to smother his initial effort with Everitt sweeping the loose ball away a couple of yards from goal. 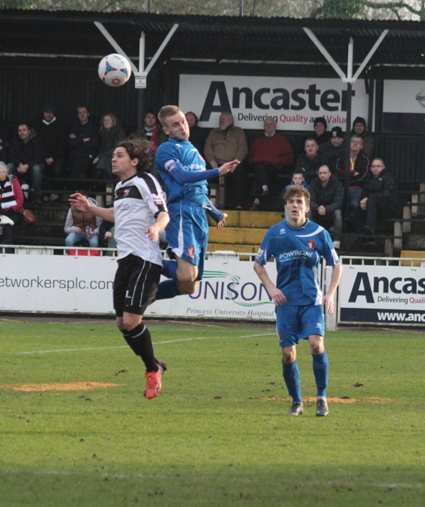 United continued to press the home goal, Luke Williams saw an attempted cross loop up off a Bromley player forcing Welch to tip what now became a goalbound effort over at full stretch. Then minutes later United were level. Williams fired a corner kick to the near post where Inman got his head to it first with Pooley on the line again only able to help it into the roof of the net on this occasion. Sadly for the United the scores were level for less than a minute as Albert Jarrett was given far too much time and space on the right side, his curling cross being met by the faintest of touches from Nic McDonnell as the ball glided into the far corner of Young's net. United continued to press for what would have been a deserved second equaliser in what was now monsoon like wind and rain. Williams drove in a free-kick that Wishart flicked on with his head some 20 yards out with the swirling wind forcing Welch into another full stretch tip over. The returning United loanee was inches away from levelling seconds later when having received the ball outside the corner of the box his stinging drive struck the outside of the post and went wide.